Jack Cashill is the man behind the accusations that William Ayers ghostwrote Obama's memoir, Dreams From My Father. Last year, Cashill released a book on the subject, Deconstructing Obama. 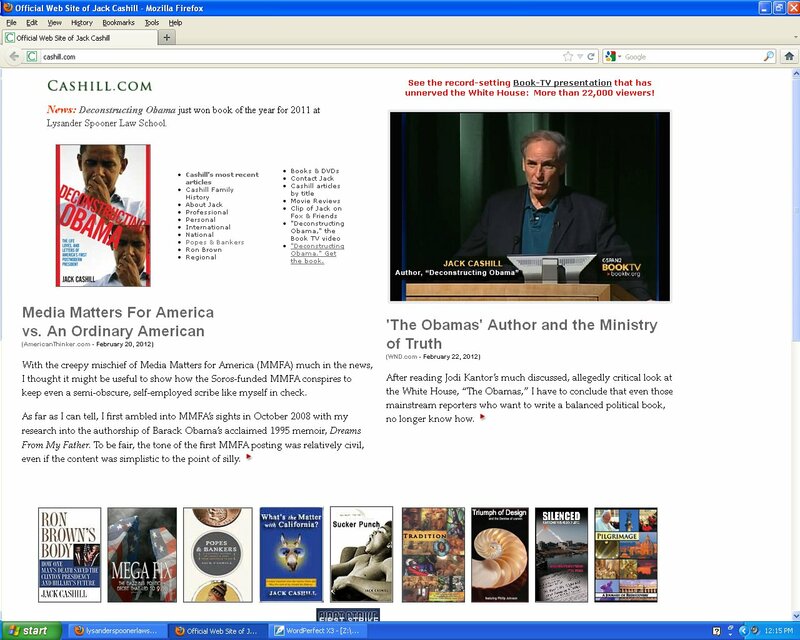 "News: Deconstructing Obama just won book of the year for 2011 at Lysander Spooner Law School." Funny thing, though: there is no Lysander Spooner Law School. The "school" is nothing more than a bare-bones blog, with sections on Terry Lakin and "Pretensidential Politics" [sic]. If you Google the name, the second result is Cashill's own website. The site is run by a single person, Kenneth Olsen. He said that in setting up the site, he hoped for people to "apply for admission at a low cost, and earn a diploma if you pass my tests." In other words, he wanted to sell people fake law degrees. He's also, unsurprisingly, an avid Birther, who has lately been trolling over at ObamaConspiracy.org. One of his other websites is the not-at-all-racist http://jiveasspresident.com/. But the extent of Olsen's silliness is beside the point. It's Cashill who's important here. In the Media Matters-themed article that can be seen at the bottom of the screenshot above, Cashill complains about how he is not taken seriously as a journalist or a researcher. Perhaps this is why. He's bragging about having won a nonexistent award, from a nonexistent law school. Not just in passing, or buried in a bio; it's prominently displayed at the top of his website. Since he links to the page where Olsen made up this crap about an award, Cashill is also fully aware of what the website for LysanderSpoonerLawSchool.org looks like, and it looks nothing like an actual law school website. So if he can't spot the difference between a law school website and an internet troll's blog, and if he can't be bothered to take two seconds to do a web search for the 'school' that supposedly honored him, why should anyone take him seriously about his ability to spot similarities between writing styles? Or worse, what if Cashill did spot the difference, and did realize that the school was fictitious, but still decided to brag about having "just won book of the year for 2011 at Lysander Spooner Law School" anyway?